A little over 5 years ago, I created a post about outlining and how to build in Minecraft on a “1 meter to 1 block” scale. In this series, I really kept things basic teaching only how to build at a 90 degree angle. I kept this simple because the algorithm to create scale builds on a unique angle can get sloppy and might be too difficult to do at first run. My goal with each tutorial I make has always been ease of use and the ability to pick up what my point is within minutes. I’m now thrilled to say we have made our outlining tool public and want to share it with the world! 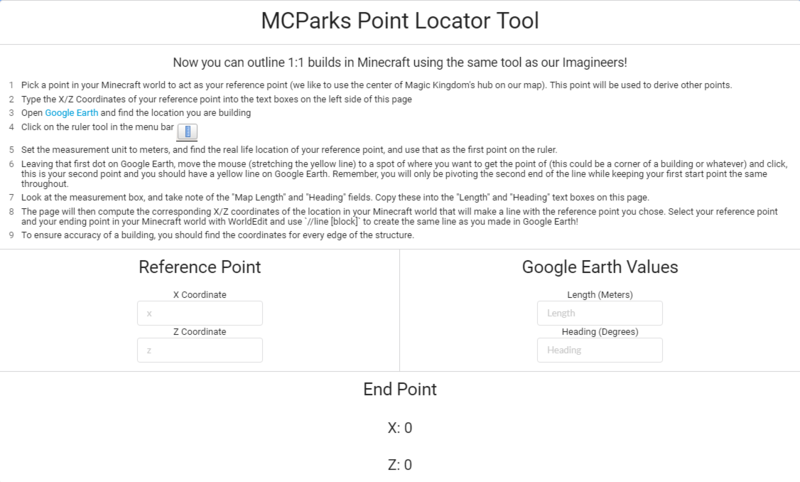 Pick a point in your Minecraft world to act as your reference point (we like to use the center of Magic Kingdom’s hub on our map). This point will be used to derive other points. Look at the measurement box, and take note of the “Map Length” and “Heading” fields. Copy these into the “Length” and “Heading” text boxes on this page.